There’s an upscale restaurant close to where my husband and I live that we have talked about going to from time to time. I think we even once made reservations and then cancelled, or at least we looked into making reservations, and then for one reason or another, we just never made it to the restaurant. Something would come up, it just didn’t feel right, life got in the way. Then one night, we said, let’s just do it. Let’s plan a dinner date one night, make a reservation and just go for it. How will we ever know if this place is as good as its advertised to be if we don’t go and check it out. So we made reservations and we found out for ourselves why this particular restaurant has such a good reputation. 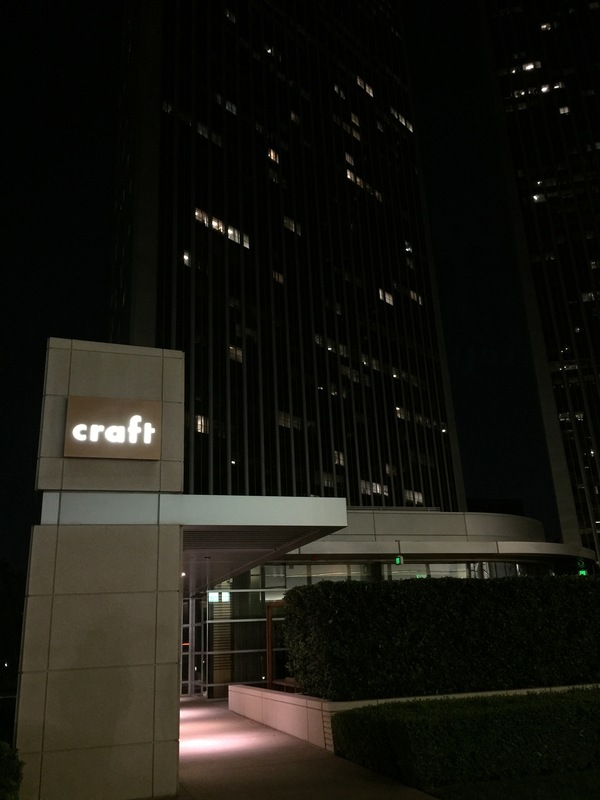 Craft, the brainchild of celebrity chef Tom Colicchio, opened in 2007 in Century City after 6 successful years in New York. Built upon the ideals of preparing and serving local, fresh and seasonal fare, Craft’s staples and cooking philosophy fit right into the ideals of West Coast cooking and eating. With a varied and wide menu, Craft is designed to make the guest feel like they are coming into someone’s home and enjoying a nice, home cooked meal. As such, all of the items on the Craft menu are prepared family style and served in the middle of the table for everyone to share and create their own plates based upon their own taste palates. My husband decided to start the evening with this go-to drink of late, the Old Fashioned, which he requested to be made with Bulleit Rye. I always love the citrusy aroma of the Old Fashioned when its brought to the table, it’s always got that strong orange scent, which I assume is due to heating up the orange rind before dropping it into the drink as a garnish. 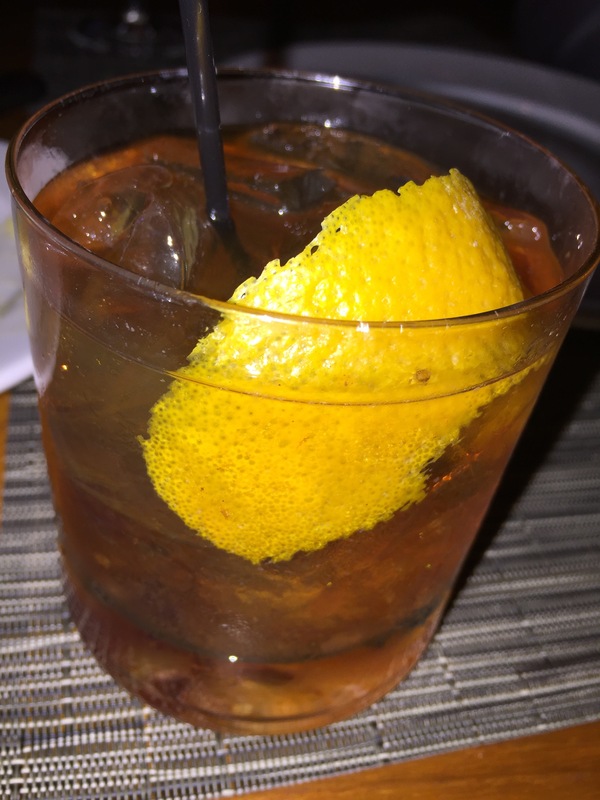 My husband really liked this Old Fashioned. Using higher quality whiskey really brings out the whiskey flavor in the drink. The drink was strong, and the bartender certainly didn’t skimp on the use of the whiskey at all. 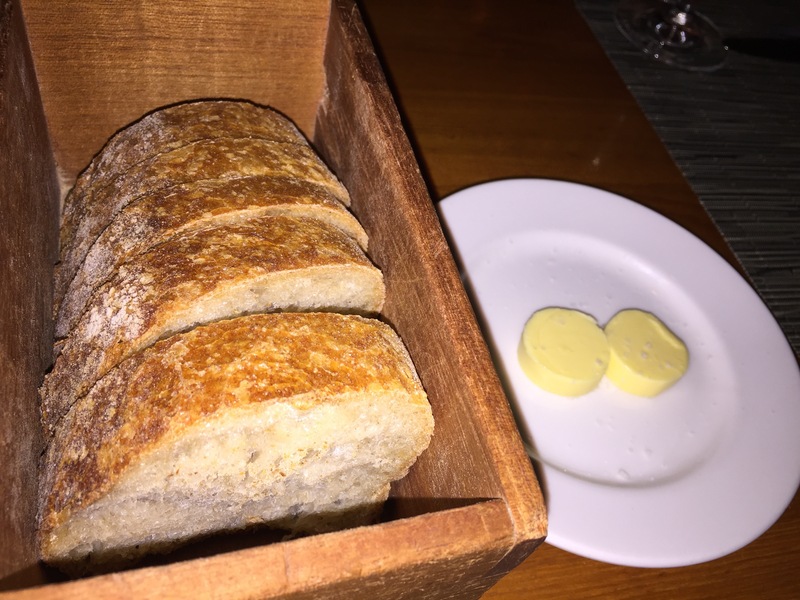 The waiter brought a bread box of fresh, housemade wheat bread and butter to the table. I loved the old fashioned feel of presenting the bread in a rustic bread box. My husband and I both loved the bread itself. Even though wheat bread isn’t always my bread of choice, this bread, fresh out-of-the-oven was so delicious that it was hard to even tell that it was wheat and not white. Before our meal came to the table, we were also presented with shooters of tomato gazpacho as an amuse bouche. Interestingly enough, these shooters looked more like a carrot puree soup to me rather than the pink-red color you’d imagine tomato gazpacho would be. But it didn’t matter what color they were, the flavor was outstanding. The gazpacho was tangy in flavor with that tomato acidic bite. 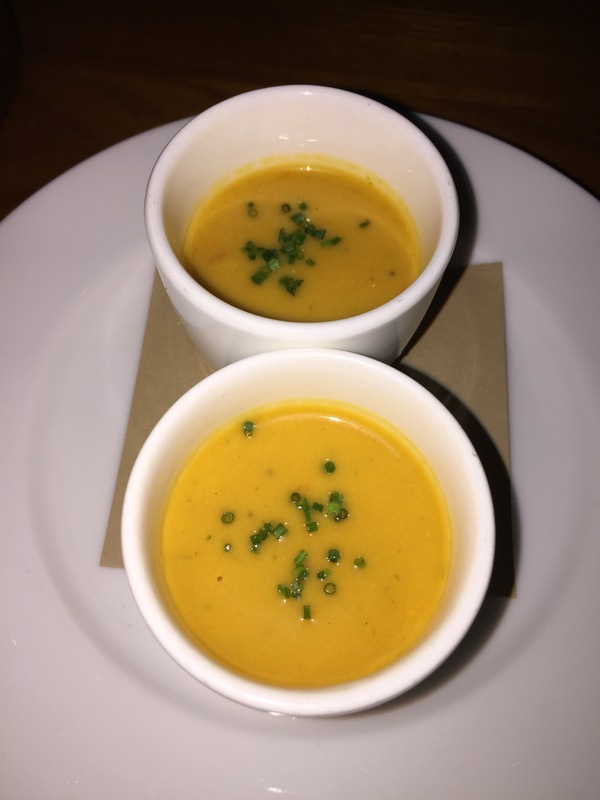 We both agreed that the gazpacho had a nice earthy flavor to it, and presenting it in a shooter gave us just enough of a flavor for it to whet our appetites for the rest of the meal to come. 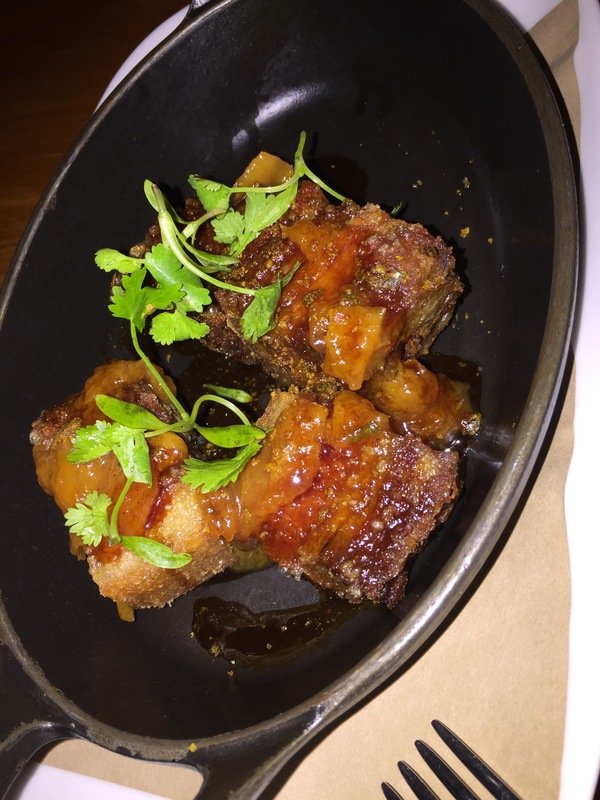 We started our dinner meal by ordering the pork belly with peach preserves as an appetizer. What we got was exactly as it was described, some fried pork belly topped with fresh peach preserves in a dish that was just outstanding. My husband said that this dish was way better than he expected it to be. He let me order it because this was what I wanted, although he wasn’t the most thrilled with it as he’s not a fan of peaches whatsoever. However, in the end, he relented and agreed that the peach was a great pairing for the salty and fatty pork belly. The outside was super crispy, and yet the inside was tender and incredibly flavorful. For a salad, we ordered the arugula salad with pine nuts and parmesan. It was also served with a couple of thin-slices of preserved lemon which just added a punch of flavor to the salad. Though the salad was so simple, it was wonderfully delicious and fresh. The peppery bite of the arugula paired really well with the salty pork belly. 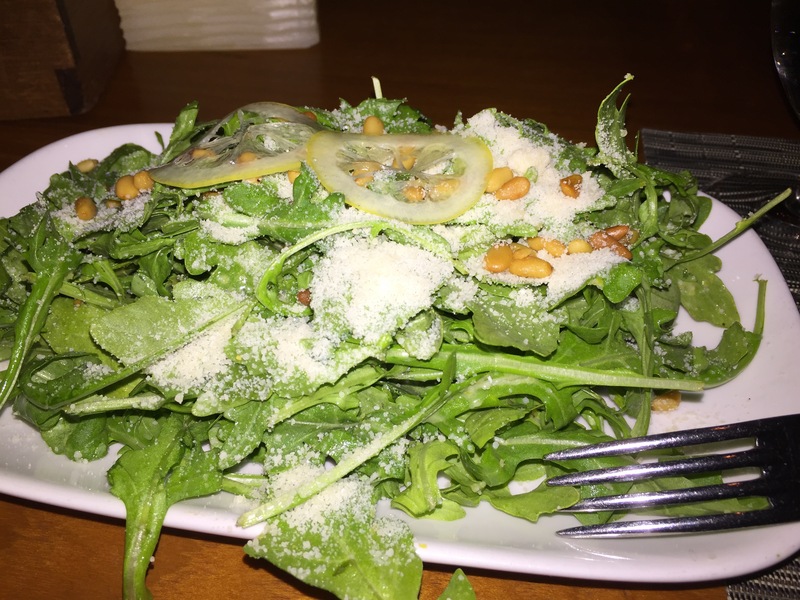 The little punch of preserved lemon, along with the light lemon dressing on the arugula was just the perfect pairing, the crunch from the toasted pine nuts, and the slightly salty flavor from the grated parmesan was just perfect. Even though everything at the restaurant is served family-style at the table and meant to be shared, my husband and I each chose our own entrée to share with each other. I ordered the braised beef short ribs. 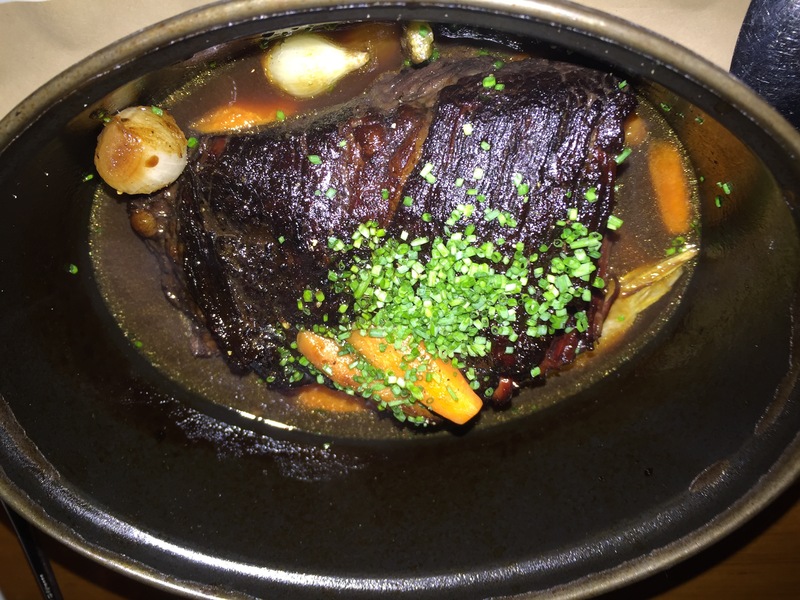 Served in a piping dutch oven, the short rib was a much larger portion that I had expected it to be. Served in its own cooking jus atop tender roasted cipollini onions and baby carrots, the short ribs were super flavorful and tender. The meat literally fell apart on my fork. That braising liquid was incredible, and the vegetables were hearty and tasted fantastic cooking in that braising liquid and absorbing all of that incredible flavor. This literally was large enough for two people to share. To go with our entrees, we also ordered a couple of side dishes. My choice was the potato gratin. Served up in a copper skillet, the potatoes were so delicious. There was tons of great, cheesy and creamy flavor. The top of the gratin was perfectly cooked and the cheese was baked on and gooey. The potato slices were fork-tender and super fluffy. 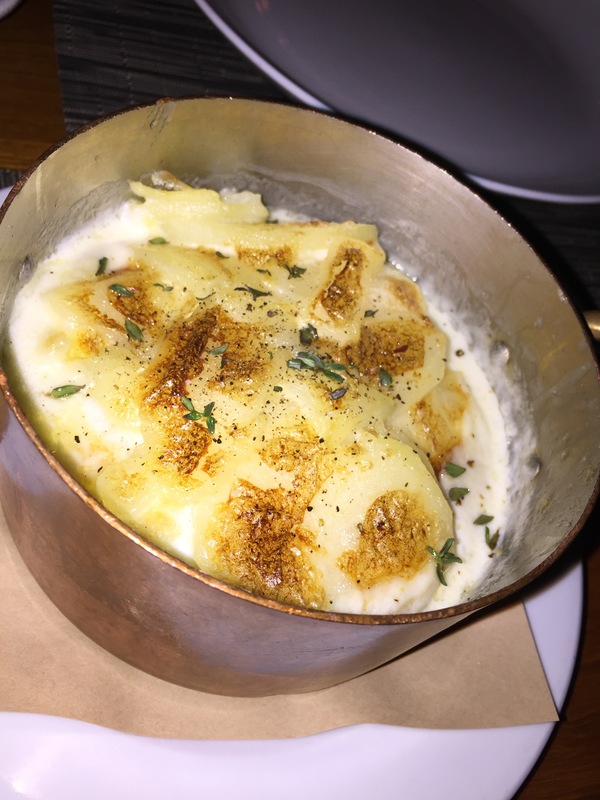 The potatoes weren’t too rich or overpowering, which I really appreciated because in a gratin, sometimes the cream and the cheese takes precedent over the potatoes themselves, and in this dish, the star was the potatoes. My husband went with a choice of side that I would never have gone for, but he really wanted and said he would eat them himself: roasted assorted mushrooms. 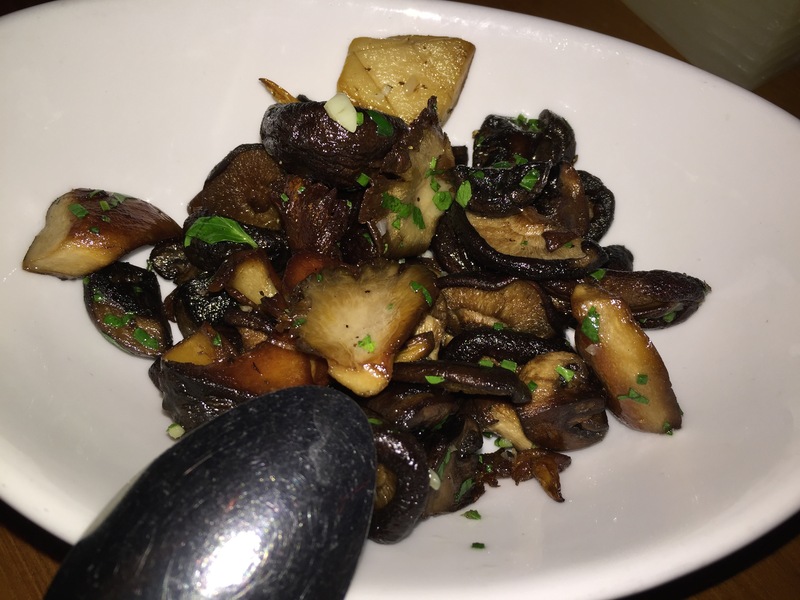 As the menu states, it’s just a plate of assorted roasted mushrooms which my husband just loved. The mushrooms were roasted in some sort of braising liquid which added flavor and earthy tones to the mushrooms and left them caramelized, but moist. My husband liked all the different varieties, and even asked me to give one a try just to see what I thought of them. Even though I’m not a lover of mushrooms by any means, I must admit that they were pretty tasty. Not surprisingly, my husband chose for his entrée the roasted duck breast. Again, served in a cast iron pan, this too was large enough for two people to share. Neither of us realized that this duck would be this large, but boy did it make my husband’s mouth water. The duck breast was perfectly cooked and sliced and the skin was left on the meat. One bite and my husband declared this the best duck he’s ever had. The flavor on the duck was amazing and tender and yet the skin on the outside was crispy and crunchy. 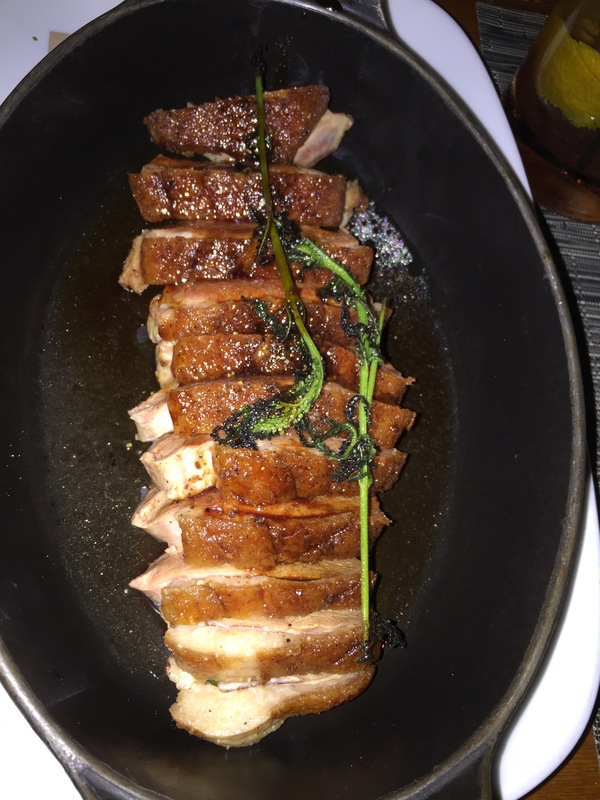 It was like having the best of both worlds, both crispy skin and super tender and juicy duck breast. It was one of the most flavorful pieces of duck I’ve ever had as well. Since I had my short rib, I left my husband to enjoy his duck, for which I think he was thankful that I didn’t try to steal too much of his duck. As I said, one bite and he wanted to devour the whole thing because he loved the flavor of the duck breast so much. By the end of the meal, I was full, but there was no way we were going to leave without at least checking out the dessert menu. 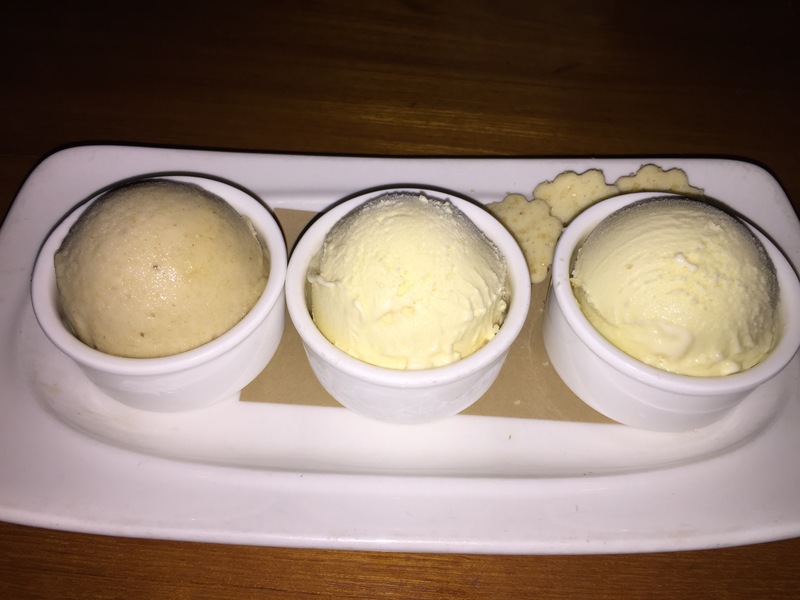 We originally said that we would just share one dessert, but after looking at the menu, my husband couldn’t help himself and decided to get his own dessert. For my dessert, I chose the trio of ice creams and sorbets. There was a variety to choose from, and I chose banana sorbet, coffee ice cream and wild fennel ice cream. The banana sorbet was an obvious choice as I can’t resist banana anything. At Craft, all of their ice creams are hand churned daily as are the sorbets which are house made. Of the three choices, I liked the banana sorbet the least, though I knew going in I was wouldn’t like it as much as the rest as it was sorbet and not ice cream. While it’s nice to have a fresh sorbet that’s just made up of the fruit, I prefer my banana to have dairy and be a nice creamy, sweet ice cream rather than a sorbet. The coffee ice cream was out-of-this-world in my opinion. It was so rich, and tasted like a cup of fresh brewed coffee in a chilly, creamy ice cream. I loved the creaminess and thickness of the ice cream and the flavor really packed a punch. The wild fennel ice cream is the one I really went out on a limb for. Generally, I’m not the world’s biggest fan of fennel because I don’t love the licorice bite of fennel, but the ice cream for some reason just stood out to me because it was so different that I felt like I had to try it. The ice cream was definitely sweeter than I thought it would be, but it definitely was fennel. You could taste the undertone of fennel in each and every bite and it had a slightly licorice after taste, but not one that was off putting at all, which was nice. The ice cream tasted fresh and clean, and all of them definitely had the flavor of being home made and fresh, and you could really tell the difference. My husband decided he wanted to order a cheese plate as his dessert choice. 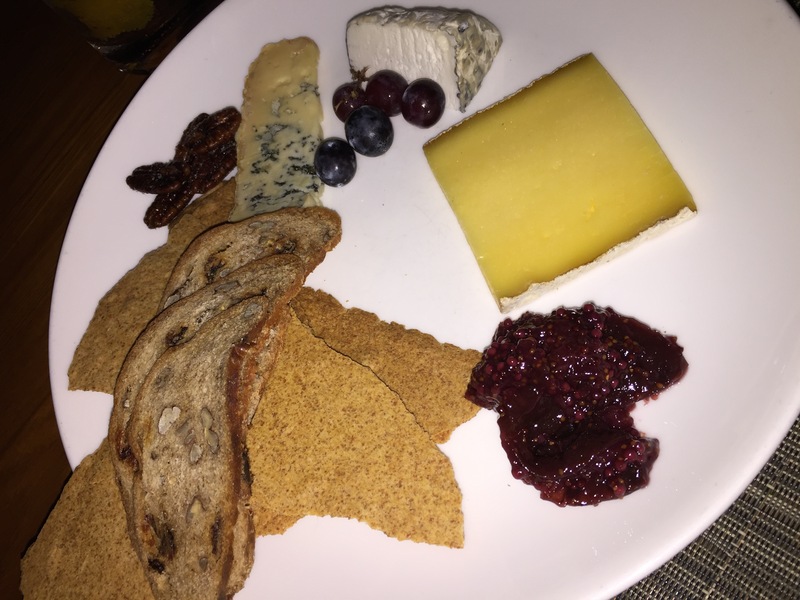 The cheese plate came with 3 different types of cheeses along with some jam, toast, raisins and grapes. The cheeses were a Glacier Blue from Washington which was made from raw cows milk, Mount Baldy cheese from California made from goat’s milk, and a Highway 1 from California which is a cow’s milk cheese. My husband and I agreed that the Glacier blue was really strong, but really good and flavorful. This wasn’t a mild blue cheese by any stretch of the imagination, but the flavor wasn’t too overpowering, which was nice. The Highway 1, which is a cow’s milk cheese, was very reminiscent of a favorite cheese of mine, which is the Humboldt Fog, which is a goat’s milk cheese. They both a similar flavor and texture profile. The Mount Baldy was really weak and mild in flavor and was our least favorite cheese. 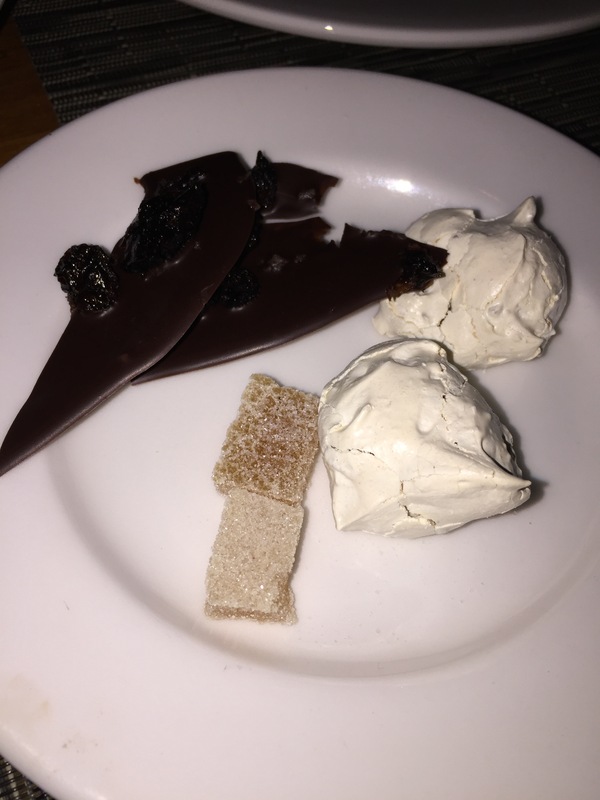 Unbeknownst to us, the restaurant provided us with a little after dinner treat with a plate of chocolate bark, spicy apple pate de fruit, and a pecan rocher. The chocolate bark was delicious, but then again, when is a homemade chocolate dessert a bad thing? The spicy apple pate de fruit was kind of like a gummy or fruit chew. My husband really enjoyed it and I gave him my piece as well. The pecan rocher was delicious as well with a bit of a chewy, yet crunchy texture which was different from the rest of the desserts. This was a well-balanced plate to end our evening. But to our surprise, this wasn’t quite the end of the night. Before we left for the evening, our waitress handed us two bags of homemade granola. 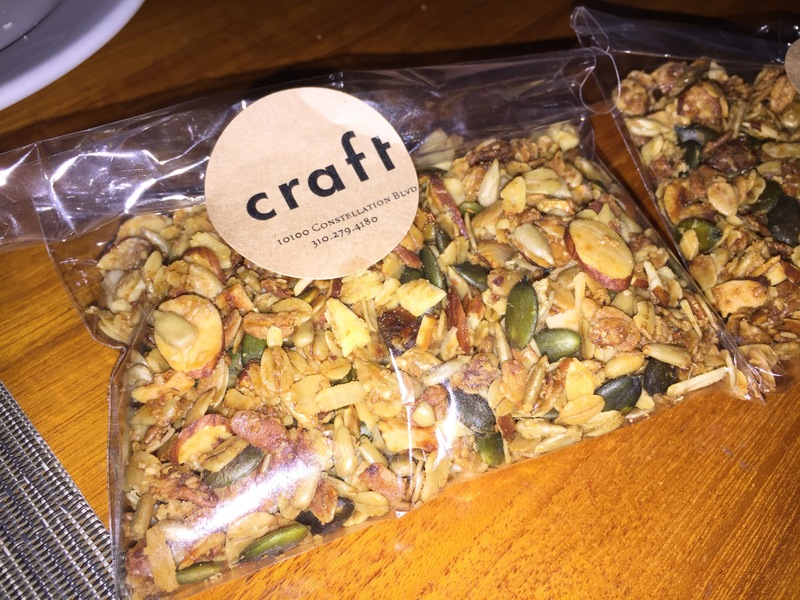 Every guest of the restaurant was being sent home with their own bags of granola, sort of as a way for patrons to continue to live and re-live the enjoyment of their meal at Craft even when they are no longer at Craft. After talking about wanting to dine at Craft for so long, we finally did it, and once we did it, we couldn’t figure out what had taken us so long to go. The food, the service, the experience, was all top class. Everything we ordered was perfectly prepared and tasted amazing. And again, we wondered why it had taken us so long to dine at Craft. Craft is a terrific date night location or the perfect setting for celebrating any sort of special occasion. My husband and I have already tried to come up with the next “special occasion” that we can treat ourselves to our next meal at Craft. Love this blog, and never miss an update! I’m curious, how was the granola?